The 1999 East Coast Championships for HO Scale electric slot cars were held April 10th & 11th in Suffield CT at the home of Dan & Melanie DeCosmo. More than 20 racers attended the Friday night practice session and 80 entries were garnered throughout the weekend. This years event was held in conjunction with the last race of the season for both MARC classes Production & Modified. Saturday began with the normal format for MARC with Production going off 1st on the 21st Century Clubman track. 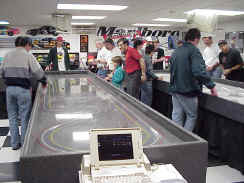 Fourteen entries made up the event of which six were MARC members battling for season points. The winner today was Joe Dausa of Florida who charged hard in the last heat to get by MARC regular Dave Kaiser who took home 100 point for being the 1st finisher of the MARC members with an overall 2nd place for the day. Warren Gohacki took 3rd today and gathered 95 points for his 2nd place MARC finish. Newcomer Erik Eckhardt rounded out the feature event in 4th while Peter Monemvasitis took 5th followed by Tim Catterson and Tom Schilder. Gerry Cullen placed 8th while Mark Rost "as in frost" took down the 9th spot. Joe Catterson rounded out the top 10 while Brian Skidmore (should have skidded a little less) took home the 11th spot and kept his eligibility to run Production alive for next season. Paul Marotta placed 12th while his son Perry had to settle for 13th just ahead of Junior "swordfish" Fisher in 14th. Even though he tried not to (by "sleeping late") Mark McQueeney wrapped up the series title for Production and will be bumped out this class by MARC rules. Congratulations Mark! Modified was next on tap and 28 racers took to the 21st Century Clubman layout with their Tomy Super Gs Todd Duda would prove to be best prepared today as he jumped out to an early lead and never looked back while cruising to a 16 lap win over 1999 MARC Modified class Champion Bruce Beaulieu of New Hampshire who was 2nd. Victor Feliciano posted a solid 3rd while event organizer Dan DeCosmo rounded out the feature event. Tom Gray came up just short of the main an took 5th place as he watched Todd continue on and take 2nd place for the season away with his excellent run. John Pileggi was sections behind Tom in 6th while Mark McQueeney, John Schoenfeld, Dave Kaiser, and Peter Monemvasitis rounded out the top 10. Jim Macartney missed the top ten by just a lap in 11th while Nick Page edged Eric Chagnot out of 12th by just a track section, Joe Dausa was just a � lap back in 14th while Eric Eckhardt was 15th followed by Mark Rost in 16th and Warren Gohacki in 17th. Tom Schilder "as in builder" was 18th and Justin "the rules have changed" Kudelka was 19th while Mike Martyn settled for 20th. Tim and Joe Catterson were 21st & 22nd edging out Mike Rauza in 23rd. Tim "Shelter" I mean Shetler took 24th while Gerry Cullen posted a 25th place finish. Brian "skidded even more" Skidmore was 26th while Jeff Phoenix settled in at the 27th position. Wayne "a dollar a lap" Wallace broke early and finished with 5 laps. Super Stock was next and would be run on the white surfaced Bucktrack. 18 entries took to the track and the entire feature was filled with the new P2 chassis from Wizzard. When the dust settled and things calmed down Todd Duda would be 2 for 2 on the day with his 2nd win of the day. Once again Bruce Beaulieu followed Todd and Victor Feliciano and Dan DeCosmo were 3rd and 4th. Wayne " good thing this race wasnt a dollar a lap Wallace" faired much better and took 5th with 486 laps, while Tom Schilder closed out the feature in 6th. Mark Rost had a good run and took 7th place followed closely by Joe Dausa in 8th, John Pileggi in 9th and Jeff Phoenix in 10th. Mark McQueeney placed 11th followed by Peter Monemvasitis in 12th. John Schoenfeld placed 13th while Frank Spena Jr. was 14th followed by Dave Kaiser in 15th, Tim Shetler in 16th and Tim Catterson in 17th. Rudy Rowsan had early troubles and finished 18th. Sunday morning 14 racers took to the Bucktrack for Polymod/RO and track owner Dan DeCosmo would prove to be tough today as he took TQ and the win. Dan was followed closely by Todd Duda who came up 5 laps short of the hat trick with some mysterious electrical problems. Joe Dausa continued his excellent weekend with a 3rd as Jeff "Hoss" Phoenix piloted his Wizzard ride to an impressive 4th place finish edging Harvey Goodwin in 5th. Tom Gray continued his typical Bucktrack blues and missed many heats with lots of HEAT in 6th. Bruce Beaulieu had some tough luck and just missed the main followed by John Schoenfeld in 8th who was followed closely by salesman of the month Justin "lets make a deal" Kudelka in 9th. Tim Catterson rounded out the top 10 while Frank Spena Jr. took 11th, Tim Shetler was 12th just ahead of Joe Catterson in 13th and Willy Goodwin broke early and settled for 14th. The Unlimited cars were next and six Slottech Cheetahs took to the Clubman to do battle. Tom Gray set the pace with a qualifying time of 1.913 second around the 75-foot layout. Joe Dausa ran a clean four heats and posted his second win in as many days as he took the win over Dan DeCosmo who lost a gear and a body in what looked to be a bid for his second victory of the day. Willy Goodwin also had problems and nursed his car into 3rd while Tom Gray clawed his way to 4th with many pit stops. Rich "welcome back" Kana had gear problems with a car that looked to be the class of field early on. Harvey Goodwin continued to struggle and his problems cut his day short and left him in 6th. 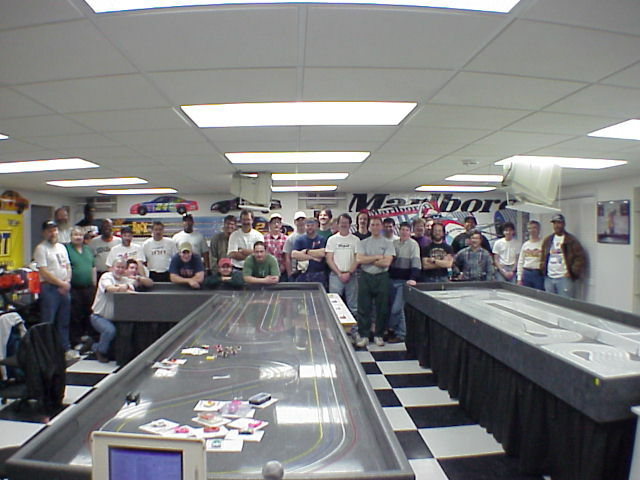 This years event was 5 classes of great racing and fun. LaneMaster kept things running smooth and got us finished each day at a reasonable time. Many thanks go to everyone who helped out during the weekend (Mike Rauza running the computer, JK going for Pizza "yes PIZZA" Hoss cleaning up at the end of the day and to the many others that pitched in thanks again.) Also a big thanks goes to Bob Ferrara of Bobs Super Products for his gift certificates and for setting up his booth of cars and parts. As always Bob Lincoln of Wizzard, Gary Beedle of Scale Auto, Tony Porcelli of Slottech all donated prizes and I would to thank them all for their generosity as well as to John Warren for his magnet zapping gift certificates.